Beautiful brunette Cissette Floral Romance Bridesmaid is is dressed in a striking dress that combines a taupe silk skirt and a green bodice that features floral organza trim & is highlighted by a beautiful pink sash at the waist. A pink ruffle edges the cuffs & is also the color of her shoes. 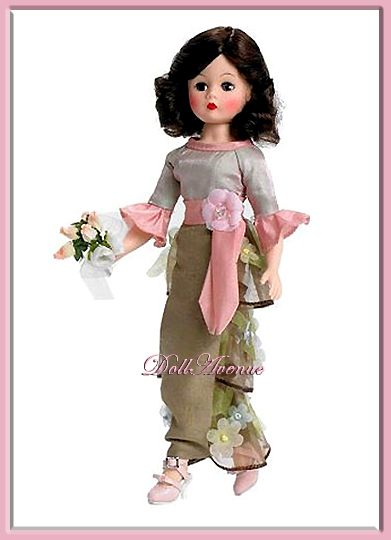 A bouquet is the final touch for the Floral Romance Bridesmaid.”Floral Romance Bridesmaid Cissette will arrive in Mint condition, having never been removed from her box. She will arrive with her original hand-tag, registration card, and box.